Our Middle East adventure had now come to an end, it was time to say goodbye to newly made friends and to a city which has kept a bit of our hearts. None of us wanted to say goodbye, but it was time to head back home. The trip back was split into two parts. Muscat to Abu Dhabi and Abu Dhabi to Doha. We set off relatively early as to make sure we had plenty of time on our hands. The drive from Muscat to Abu Dhabi is about 600 km plus border crossing. Confident our new toy (GPS we had bought the day before) will keep us on the straight and narrow we set off. The route we took was different to the way we came as we were heading to Abu Dhabi as opposed to Dubai. We also set Waze (phone application GPS) just as a back up (as well as our trusty map). About 200 km into the drive we hit the first “glitch”, dreaded roadworks and no detours. A roundabout we had to go off at had been replaced by a flyover, meaning the road layout had changed! The GPS wasn’t impressed and refused to recalculate and Waze did what Waze does, it went into a blind panic and self-destructed. We eventually found our way back onto the right road but it cost us about 1/2 an hour messing about. 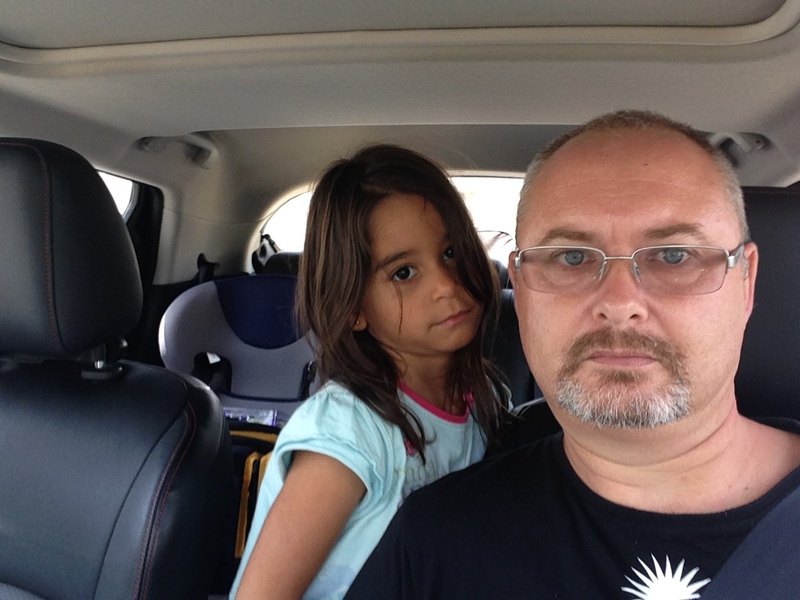 The GPS was happy, I was happy, Cathy was happy….and Katja was totally oblivious at all this as she was busy watching TV in the back. 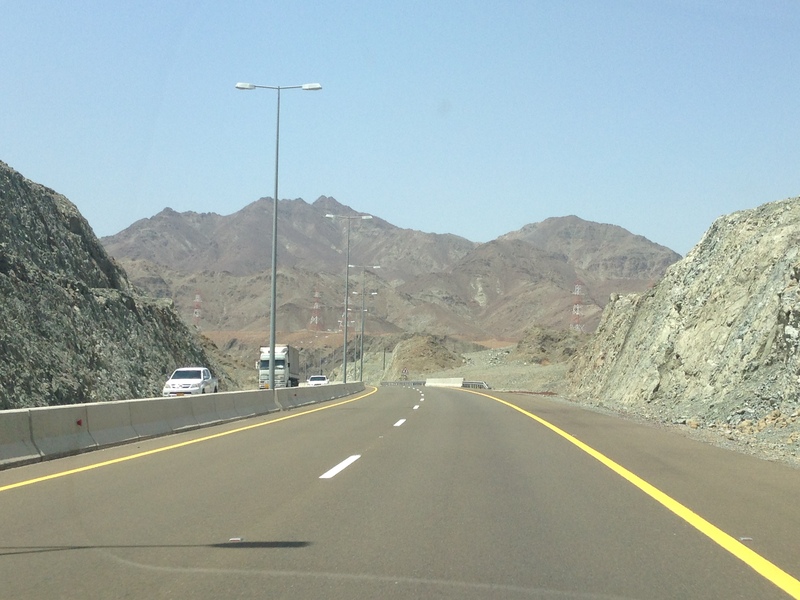 The next stretch of road was fine, no issues, well, not until we reached the Oman/ UAE border. 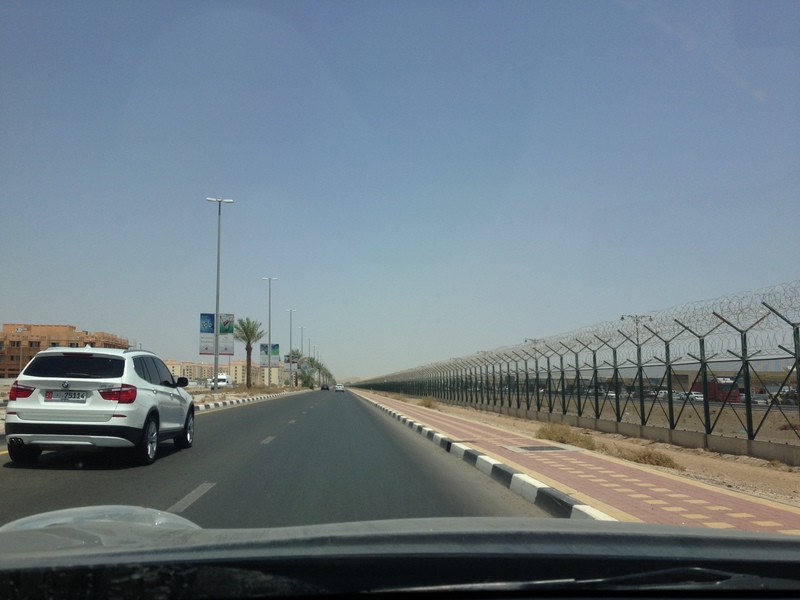 The GPS took as (quite rightly so) to the border with UAE, however, it failed to take into account that this border is for GCC nationals only. GCC stands for Gulf Cooperation Council and is made up of the following countries: Bahrain, Kuwait, Oman, Qatar, Saudi Arabia, and the United Arab Emirates. We have residency in a GCC country but we are not GCC citizens, this meant that we were turned away at the border and told to go to the “other” border control which is about 5 km down the road. In this area not many people speak English so stopping and asking for direction was a waste of time and the GPS was as useful as a chocolate tea pot. We found a petrol station and Cathy asked for directions. It wasn’t too hard to find. If you are reading this intending on doing this trip, you need to look out for HILI Crossing! Eventually, we found our way to the border. Cathy popped in and sorted out the relevant paperwork, soon after this, we were back in the United Arab Emirates and en-route to Abu Dhabi. This was the last hotel we had booked. If you haven’t watched Faulty Towers, please take a look at the clip below before continuing reading! We arrived at the hotel which can only be described as a full blown building site. (on booking.com when we booked it said the reception area was undergoing some building work). There were building materials all down the side and it looked like a complete building site! I stayed in the car and Cathy went to check in as well as to ask exactly where were we to park! She emerged (several) minutes later looking quite unimpressed, along with her was a member of staff from the hotel. He told us to give some guy 15 Dirham ( 3.63 Euros) and this will cover parking till tomorrow. After the chap from the hotel had left we unloaded the car, gave this builder the money and thought nothing else of it. The hotel chap came back out to help us with our luggage and to make sure we had put the ticket in the car. What ticket? We told him the builder hadn’t given us a ticket. At this point we realised that the hotel guy was pointing at a parking meter, not the builder and he had told us to put money in the meter! Of course, the builder didn’t understand what was happening, he was quite happy with this free gift. In fairness, they get paid so little, I didn’t and wouldn’t have the heart to ask for it back. Anyway, we paid at the meter, put our ticket in the car and then the fun started! We paid for our stay but reception didn’t have change, they told us to come and get our change sometime later. Bear in mind we are doing all this in a building site. We headed off to our bedroom only to once again find there was no bed for Katja. We rang reception who proceeded to send someone with a travel cot. I was losing my sense of humour very quickly at this point and using Katja’s favourite doll explained a carry cot is for a baby. Doll = Baby, Katja = small child. Go away you little annoying man and come back with at least a mattress! This was a bit too much to ask, he turned up with a duvet which he proceeded to put on the floor saying ” yes sir, this is very comfortable” would baby also like a pillow and blanket. At this point I strongly suggested he left the room! We had been on the road for around 8 hours and were quite hungry, let’s have some food. A nice photo of a restaurant on the 15th floor of the hotel looked very tempting so we headed off to the 15th floor. When the lift doors opened, this too was a building site, no sign of any restaurant like the photos on the lift, just a load of Indian workers looking at us wondering what the hell we were doing there! we thought we may as well go to the pub on the first floor. This too wasn’t to be as they don’t allow anyone under 21. Unfortunately Katja won’t pass for a 21 year old. We were then told the restaurant had moved to the 14th floor. Great……Well, not really, this was a makeshift “restaurant”. In fact it consisted of a couple of tables in a bedroom! Not quite what ew had in mind. Having had enough, we headed off to reception and demanded to speak with the manager. The receptionst looked quite used to doing this and took us straight to the manager. I explained our “issues” and he was incredibly apologetic, so much so he went into full Basil Faulty mode. He moved us to a suite and went round the corner and started screaming at people. It was like the scene from Faulty Towers above. I am sure he was shouting at nobody! We moved to the “suite” which wasn’t a great deal better than before but at least had a sofa bed so Kati was OK. Soon after we had a knock on the door with someone delivering a bed. we said she’s fine on the sofa bed. A little later we had another knock on the door with a mattress, we once again explained she was fine on the sofa bed. We then had a call from reception asking if we still wanted a bed for Kati! We ended up ordering room service and hid in our bedroom. In fairness, food wasn’t bad and we survived it. We slept extremely badly as the bed, pillows and everything else was just awful. We got up at 5am and by 6 am we had the car loaded. We popped into the “restaurant” and had breakfast. The kettle in the room didn’t work so we hadn’t even had a coffee. We didn’t dare to touch too much from the tables so we just had some toast and left! For legal reasons I am not posting any photos of the hotel or mentioning name.